In the last tutorial of pipe and Cistern math tricks, we have discussed some basic math problems with the basic method, which was only for a core conceptual tutorial for pipe and cistern maths shortcut formula. But now, we are grading up a level to prepare better and going to apply some customize previous shortcut formula as per the requirement of question conditions. So friends, as per your requirement, we are trying to provide you with the best and efficient important shortcut formula for your upcoming competitive exams preparation such as SSC CHSL, CGL, PSC, Railway recruitment and banking exams. Already, you had known the importance of shortcut formula for the competitive exam in last tutorial rather than the traditional method. However, we are increasing level step by step, and it is the second part of Pipe and Cistern aptitude tricks. Aptitude 1: Two inlet pipes can fill a tank in 20 and 30 hours, respectively. A tank was 1/3 part full then both pipes are opened. How long time will take to fill the rest parts of the tank? Solve with the explanation:- We have used the formula (A*B) / (A+B) when the tank fills fully. But now we have filled 1- 1/3 = 2/3 parts of the tank. Friends think here logically, two pipes will take to fill the tank 2/3 part of the time which they need to fill the tank. So, first of all, find out the time which will take to fill the tank by using the above formula. 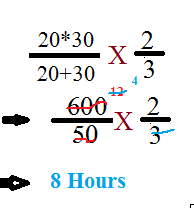 Then multiply the time by 2/3. Question: An inlet pipe can fill a tank in 20 hours. And an outlet pipe can empty a full tank in 30 hours. When the tank was 1/3 parts full of water, then both pipes are opened. Now find the time they need to fill the rest part of the tank. Solution:- Here, we also solve the problem as we have explained the previous one. Here the difference between the two questions is – in this matter pipes are inlet and outlet both and only the inlet pipe was in the first question. So the shortcut formula will change, but the solution method is the same as the previous one. Because we have to find out the time which needs to fill the rest tank (except 1/3 part) while both pipes are opened. Here, we will use the formula to find the time to full fill the tank. when both pipes are opened (A*B) / (A-B) Where A and B are time value. 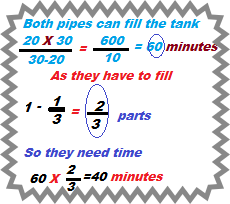 For more aptitude question and easy solution using maths tricks, visit next tutorial on Pipe and cistern aptitude tricks. In the next tutorial, we also grade up pipe and cistern math problems and aptitude tricks.